This is the last weekend day before our second big Joshua Tree Evolutionary Aikido Retreat 2016. It starts on Friday, and I need to be out the door and on the road by 8 a.m.
My body has to be in the best condition possible. Do PT exercises. Foam roll. Eat well. Get plenty of sleep. I have to be sure my car is safe to drive. New tires, check. Must get the oil changed and fluids topped off. The animals have to be cared for. Leave clear instructions for Michael. Leave the barn and feed in good shape. Michael has to be happy. Put away my mess from packing, and leave the house in decent shape. I have some special dietary requirements. Buy protein bars and bananas. Boil a dozen eggs. I need gis and clothing and stuff. Do laundry. Pack. Double-check lists. I can’t abandon the rest of life. Take care of personal training clients. Write. Train. I do not have to read that fascinating article I just saw. I don’t have to help a random person identify a weed. The pile of papers on my desk does not have to be sorted right now. That project I’ve been meaning to get around to isn’t urgent. It’s kind of like life. We always have a limited time. It’s just having a clear deadline that puts things into sharp focus. 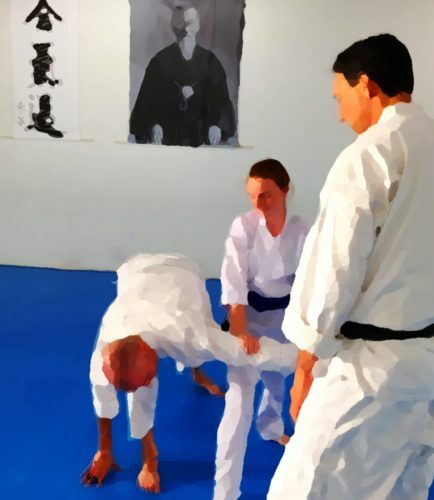 If you are preparing to go to a seminar or retreat you might also enjoy the posts here: How To Go To Aikido Seminars, Camps, and Retreats. This one in particular might be helpful. It includes an extensive to-do and packing list for road trips to Aikido events: Going to the Aiki Summer Retreat 2013! Road Trip – Off to Camp! Boy, it’s been a while, again… Not for lack of things to write about. On the contrary, things I’ve wanted to say have been pouncing on me several times a day right along, I’ve just been busy with other things – getting my business (Fit Coach Linda) up and running, teaching fitness classes, studying for an additional certification, and since the start of the year also doing strength training with an awesome personal trainer (Kyle Boggeman, of San Diego Strength and Conditioning). Of course I have been training at the dojo (Aikido of San Diego, with Dave Goldberg Sensei) almost daily, as usual, helping in the children’s programs, and playing with friends during open mat sessions. I’ve even been leading a few classes here and there, which has been a lot of fun. But the thing I’m most excited about this morning is that I’m leaving for camp in just a couple of days! The Aiki Summer Retreat, in Quincy, CA, in the Sierra Mountains of Northern California. This will be my 3rd time going to the Retreat (once at Menlo, twice at this location), and I’m really looking forward to hanging out with friends I haven’t seen in ages, and training with some great instructors. And on the way there and back I get to visit my inlaws, who are delightful people, and whom I haven’t seen in since the last time, 2 years ago. As for writing, once again I am recommitting to posting more regularly – both here and on my blog at Fit Coach Linda. I’ve been doing tons of writing in my head every day (ha! ), and a lot for upcoming books or blog posts, just not polishing it and getting it out there. Meanwhile, off to teach a senior fitness class this morning, pick up a few things for my adventure on the way home, do some work this afternoon, and then to the gym and the dojo. Woohoo!